Indian Pathways Powerpoint from my program at Kellogg-Osborne Homestead on May 2nd. The following map (published in 1930 by Griswold) was found at magic.lib.uconn.edu. It shows Indian Trails in Georgetown and Redding (1625), basically following the Aspetuck, Little, Norwalk and Saugatuck Rivers. 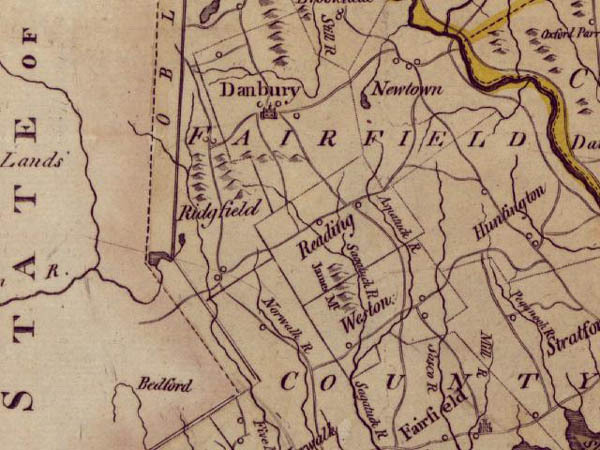 The "Berkshire Trail" appears to follow the present day path of Route 7, climbing up to Ridgefield (via Route 33) and then back into Redding through what looks to me as either the present path of Topstone Road or Old Redding Rd. to Cross Highway. I come to this assumption by the map's "Umpawaug L." notation which is on Simpaug Turnpike...the path crosses below this point and the faint "Y" looking lines, which are likely waterways, to me resemble the Saugatuck River and Little River. A recent discovery of a long lost article by Georgetown historian Wilbur F. Thompson notes that the Old Indian Trail ran up from Calf Pasture, Norwalk to Old Mill Road in Georgetown crossed the Norwalk River then went up over Mountain Rd. into Ridgefield Center. The Mountain Rd. Thompson refers to is not the (Branchville/Redding) Mountain Rd. but the (Wilton/Georgetown) Mountain Rd., once known as Chicken Street, which heads into Ridgefield...Of course, we must keep in mind that there is always the possibility that over the course of time, native Americans used multiple routes. Thompson does note Portland Avenue was an indian campground. Personally I know arrowheads have been found on Mountain Rd. and on Peaceable St. where I grew up...unfortunately I lost them as a youth. 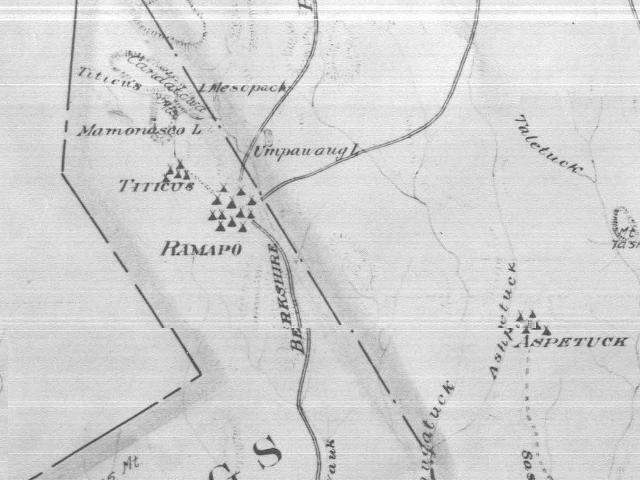 Map from 1795 shows that early settlers of this area seem to have used the old Indian Paths for their own Main Highways and Cross Highways as the routes are very similar. 1685 map of New York and Connecticut. Large river is Hudson River, to the right is Housatonic River. 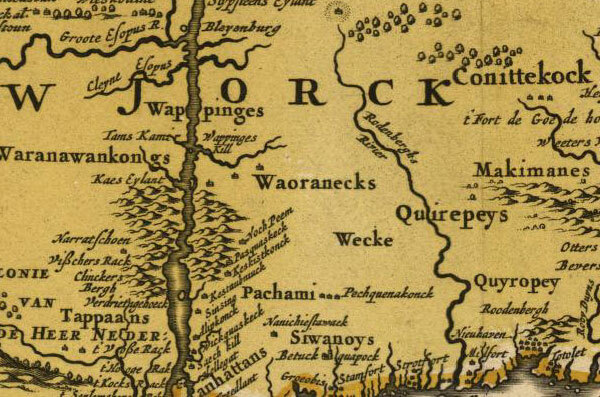 Interesting how Connecticut is spelled "Conittekock" top right. And down below Stamford is "Stamfort", Stratford is "Strotfort", Milford "Milfort". Pachami/Pechquenakonck appear in general location of the Greater Danbury Area. 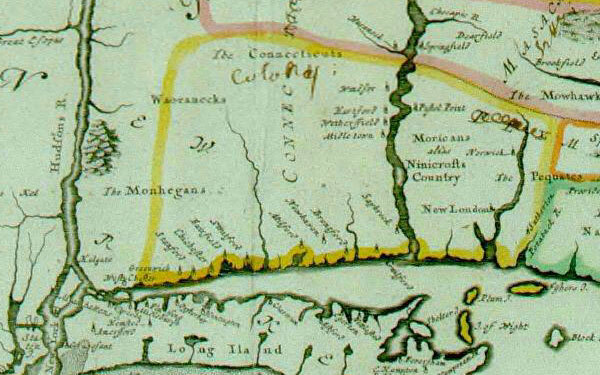 1676 map of New York and Connecticut. To search for your own historic maps visit UCONN's Magic Site. The first recognized road engineers of the present State of Connecticut were the Indians, whose skillfully laid-out routes were largely followed by the early settlers as their own trails through the wilderness. A trail was gradually developed by the white man into a path, a colonial highway, frequently a post road and later still a turnpike. Records similar to Gold's Umpawaug Deed below (that contain the word "path") can be found all throughout New England...in every State. The key is to look to Primary Sources, in the course of my resource I have found that most references to "paths", "indian paths", "indian foot paths" or "indian trails" disappear by the third source and are replaced by terms such as: "highway" or "road". Even the Indian word for a location is erased shortly after the English have taken over that area. Fairfield Probate Records 8:248-249 an Indian Deed of Umpawaug to Nathan Gold in December, 1686. 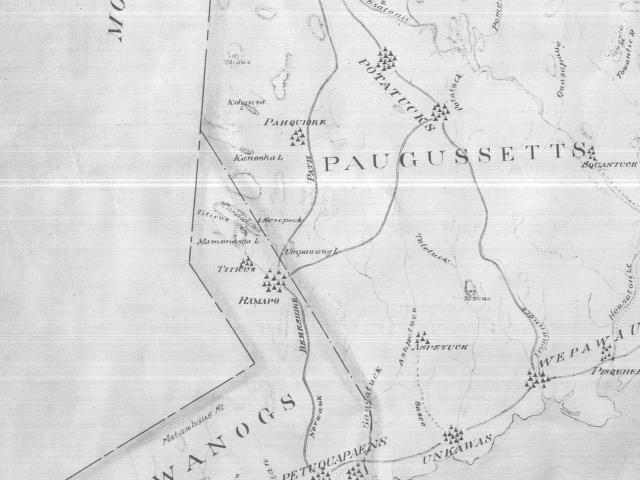 "Be it known to all men and those present...(the) rightful proprietors of a tract or parcel of land called Umpawaug lying westward of Fairfield in ye wilderness have bargained and sold...from everyone of us (Indians), our heirs, our heirs executors, adminstrators, assignees and lawful successors for our [mark] to Nathan Gold of Fairfield in his majesty's Colony of Connecticut...a certain parcel of land called Umpawaug as it is now laided out and bounded out to the Indians via a river and brook and through a pond running through ye middle of it and...across ye path that goeth from Poquiag (Danbury) ye English plantation down to Norwalke (Norwalk) and bounded southeast by with marked trees to Saugatuck River." "while the water courses may be aptly termed the primary Indian highways in New England, there were also many economically important overland trails throughout the area. Laid through ages of Indian use with an eye to the easiest and quickest topographical access, many of these trails were later adopted and enlarged into the bridle paths of the early pioneers, and eventually became the modern highways of today." Download PDF re-creation of How Manhattan looked prior to European Settlement. The Institute for American Indian Studies has many great programs! View Information on their Events and Programs.